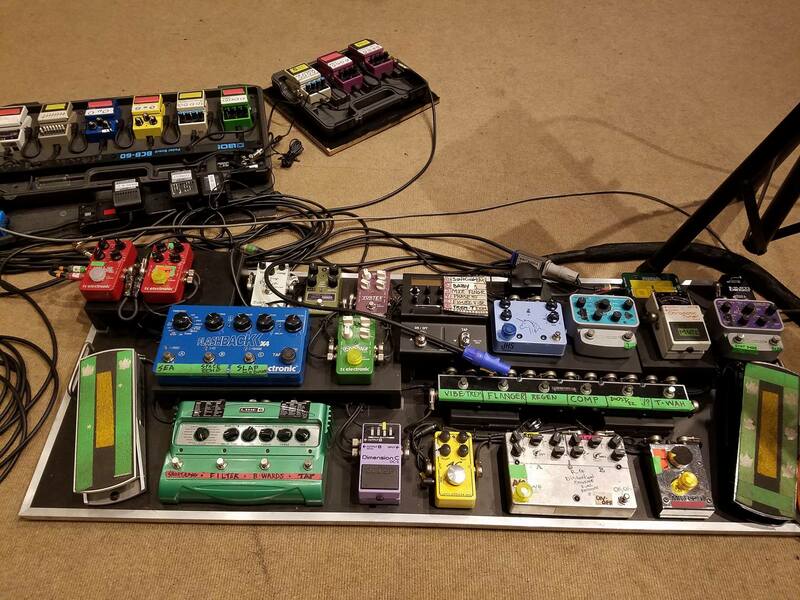 Home The Cure in Africa – Pedalboards of Robert Smith and Reeves Gabrels! The Cure are playing a couple of shows in Africa, and I’ve been catching a few videos and photos! This year, they’re playing a few festival type shows along with a few special concerts. The last time I caught them live was back on their US tour in 2016, and my only regret – that I didn’t see them more. So I’m hoping for another US tour. Fingers crossed. Over at Reeve Gabrels’ Facebook page there was a post talking about the “Your Day on the Lawns” show in Johannesburg there was talk about some of the pedalboards that were in Africa, including Reeve’s guitar and Bass VI boards as well as a shot of Robert Smith’s boards. Awesome. Check ’em out below. – Photos posted by Reeves Gabrels 3/16. Let me know if you’ve ever seen The Cure live.. or going to see them. What did you love. What songs are you looking forward to, etc. Comment below! Also, SD1, not OD3… silver knobs. RS’ board hasn’t really changed much over the years. Thanks. I updated that. The CS3 has 4 line up knobs.. but the CS2 has three. Would have loved to have seen Simon Gallup’s current pedal board. I’ve seen The Cure in every tri-state appearance (NJ,NY,PA) since 1989’s Prayer Tour. The two flangers on RS’s BCB30 look like the middle one is a BF-3, and the one on the right of the image (left of the board) is probably a 1984-1990 BF-2. The middle flanger has what looks like its left knob split in two, an outside and an inside for Resonance and Manual, and the BF-2 from that era has the black knobs with red lines, rather than the white topped knobs with black lines that the newer (?) BF-2 has. Looks like that end flanger has those short, black knobs with the red lines. 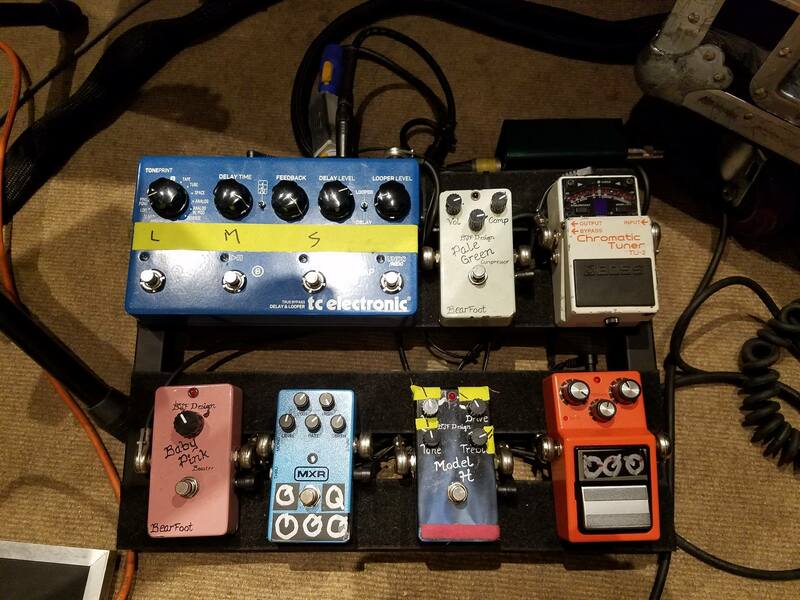 That blue pedal looks like it’s a brighter or bolder shade of blue than the BD-2 has. Also, it looks like you can see some white writing under the settings tape sticker thing, and the BD-2 has gold font, but the CS-2 has white font. Likely a CS-2 then? Both of the flangers have the purple marks on the knobs.. which I *think* is BF2? I agree on the CS2, I originally had that but a post in the comments suggested the BD2. I updated to show both possibilities now. Thanks! Hmm, could definetly be the CS2, sorry. I really don’t know what to make of it, the little bit of font under the label looks yellow-ish to me, but the font on the knobs looks white. I think Javier has a point about the flanger though, in addition to the concentric knob, the pedal has a stereo input. I updated the post again. Thanks guys! Love the gear/nerd convo on this! It’s definitely the BD-2, if you check anterior pedalboards, you’ll see the bd. He says it in many interviews and it’s shown in many photos. Also, one of the flangers, it’s the boss BF-3, you can see it with the little knob, which is the one of the bf 3. More on the flangers (sorry to go on 🙂 ), the one on the right has the power input that looks like the older style that has the plug-hole off to the right of the black plastic section, and those old ones have the plastic that goes down to the base of the casing (https://andertons-productimages.imgix.net/157816-167-0823-(6).JPG?w=680&h=680&fit=fill&bg=FFFFFF&auto=compress&auto=format), whereas the newer BF-3s have the power inputs off the bottom of the casing (https://encrypted-tbn0.gstatic.com/images?q=tbn:ANd9GcS5hGeAh1orMl_5y0POYxLAOAuCa87DtyqQiqhnUUrDbeOkNBXx0A), and they’re slightly smaller than the 1984ish ones. You have to zoom the hell out of the pictures to see it, but I’m convinced! Zooming the hell out of the images shows the white stripes on the knobs in the middle flanger, and redish ones on the right one.